I believe your specific situation is a very unique for X2Pro, as I believe you know. In order to better understand the issues you are having, and to better help users in the future; I would like to get some assistance from you. Would you be able to detail exactly your workflow from getting the file from Premier to X2Pro? How do you export it from Premier? Are there any intermediate processes in-between Premier and FCP X? Do you do anything with the file in FCP X, or just export it out as a FCPXML to give to X2Pro? Also, we would like to get the Car Pull In clip form you to take a look at in our lab. I appreciate your time on this issue. 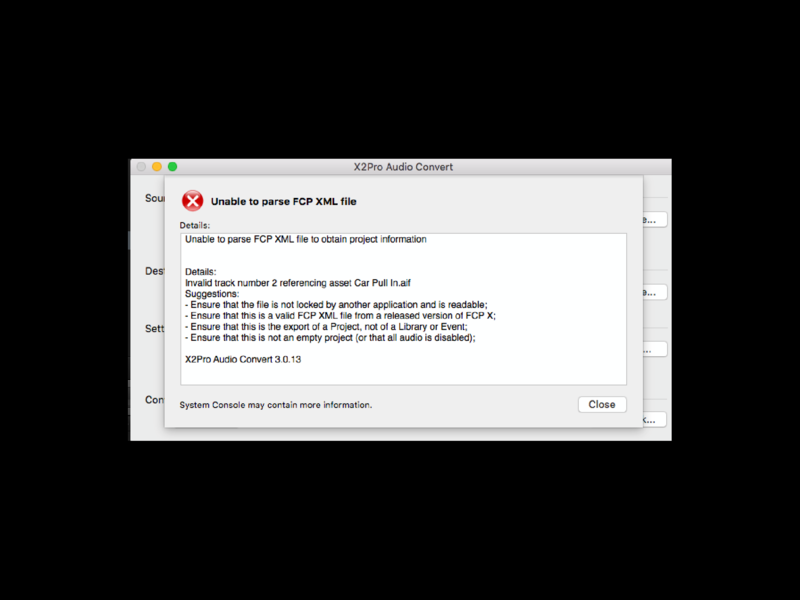 We believe it has to do with meta data errors introduced loading into premiere, or converting from premiere to FCP, but either way X2Pro hasn't been able to resolve them. If I remember correctly, he had to export the xml from FCP, Reimpiort it. Then replace every audio clip with itself (losing mix in the process)). Something like that. Just wanted to check in and verify that you were able to resolve this. This error message was from your edited file. .
Before your file, I couldn't get past first step. Your file allowed me to actually load Xml. Select destination. Approve Media drive access. And begin the conversion, at which point that second error occurred. Also, to be clear, the sound effect isn't 1 minute into the cut, it's the very first sound in the cut. When I removed it and did Xml without it, the next clip (now the new first clip) had that issue. Not sure if that is significant or not, but sharing info just in case. Sorry, just to be clear here, did this error message come when trying to use the FCPXML that i sent back or when you tried re-editing the file. I saw your note that you had deleted the file previously, but i just wanted to be clear; as i wouldn't expect you to still get this error with my edited XML. Also, in regards to if the conversion of Premier may have caused this and not actually Apple, there is no way for me to know for sure. All i know is that the reference in the XML that was exported was incorrect. When we were trying this originally, we did delete that file and try without it. Error came back with another file. Which makes me worried that no matter how many files I get rid of, there'll be several more with the same problem. Does this have anything to do with the trip from premiere to fcp by any chance? Or is this all the same Apple bug? If Apple doesn't fix it immediately, are we unable to export this audio for our mixer? The clip name in the error message "Car Pull In.aif" is used 1 time at 1 minute exactly in your project. In the XML exported by FCP, the asset description only has the file with 1 source for the audio, but then later on in the reference of where the file is used in your timeline, it is asking to use audio from a second source. This is a bug in the way FCP and Apple have exported the reference and we would very much like for you to report it to Apple directly. Apple has actually informed us that these types of bugs are best to come from the end user that the app manufacturers. We have written a script that repairs errors in formatting of XMLs for this and another similar problem and i have run your XML through it. Our program has no knowledge of your actual file layout, and only fixes the references in your project XML. The outputted XML is here. If that XML does not convert for you, we would ask that you try removing the Car Pull In.aif clip from your timeline and try re-editing it back in to see if FCP will export the correct references in the XML after the edit. Please let us know how you get along and many thanks. But this is that zip file. Edit: ps - also exported the same version in extended view xml, reimported it into fcp (it worked fine), exported THAT version as a new xml... and x2pro had same error on that file. Last Edit: 2 years 9 months ago by Filmyak. I went back to the project and did new XML output just now. This is the version that DOES have some compound audio clips. Same error as before. I zipped the XML and am attaching it here. Text from error messages are more helpful and useful, but i don't hold it against any forum posters. I can just ask for the text if i need it. Oops. Saw the "don't post screengrabs" in your rules. Apologies! I'll zip and send over late tonight. This is a side gig from home, and I'm at day gig now. Please zip and attach your FCPXML for me to investigate. Was originally referring to first piece of audio (a sound effect). So I deleted from sequence, tried again. Same error. Broke apart all compound clips. Same error. Consolidated the library into new location. Same error. Out of ideas. Any suggestions?